Minister of National Security Jeff Baron joined those in the community in thanking the bus operator, the Bermuda Fire & Rescue Service, and those members of the public who assisted following Tuesday morning’s bus fire in Warwick. 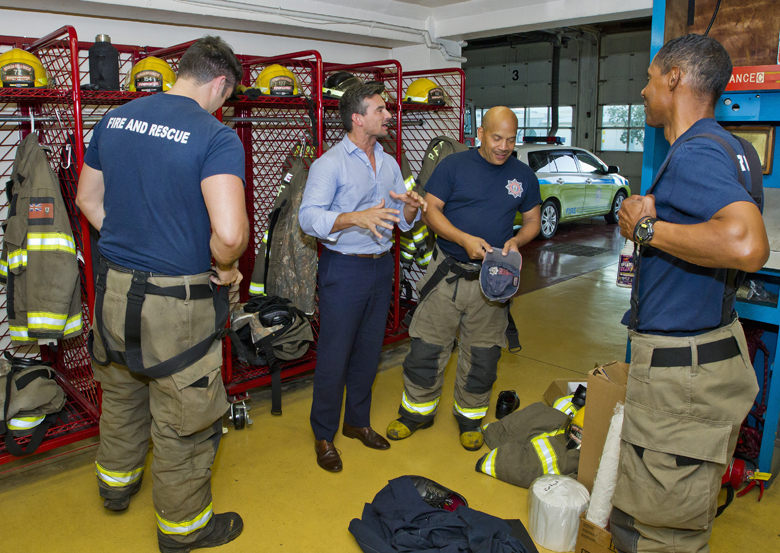 Last evening [March 8], Minister Baron stopped by the Fire Services headquarters in Hamilton to personally thank some of the fire officers who responded to Tuesday morning’s bus blaze. Minister Baron said, “The men and women of the Bermuda Fire & Rescue Service continue to make us proud. Tuesday’s bus fire by all accounts was a very harrowing and unnerving experience, especially for the young school children who were on board. “Thankfully there were no injuries or loss of life sustained in this fire. In that regard we owe a tremendous debt of gratitude to the bus operator for his bravery, courage and swift action in getting the children to safety. Minister Baron continued, “We often take for granted the dangerous and perilous situations that our emergency services personnel must engage in on a daily basis. Thank them with updated equipment. I would also like to commend the BFS and the bus driver for their quit thinking. To the OBA government, why was there no apology to the students and parents from Warwick Preschool when they bus was involved in an accident. Just asking….maybe I missed it. Does Somerfield and Warwick pay to have a bus for only their students? No apologies needed back then. That driver was under the influence. Fahy apologize’s when he is 20,000 miles away and Baron turns up always with a photographer……………………..
Never met a Camera he didn’t like. So why does he need cameras there beforehand if he wants to thank BFRS? Yes… why ARE they there for every brain fart politicians have? Election time is about kissing the cheeks. I guess he forgot that’s part of their job. Now go around and thank all the other government workers who show up to work under the UBP/oba. Anything for a photo opp you’re starting to be just as bad as the current UBP leader. Call the election after America’s Cup lets say July or August. Today I was in the pro shop and a young footballer (12) came into the shop with his Granny and Senator Jeff Baron. Jeff obviously had a close relationship with the young lad and their respect was mutual. Mr Baron bought the little guy a pair of Football boots (at significant cost and then after doing his good turn left the shop!) I am sure mr Baron would be embarressed that there was someone watching him do this. But it was obviously a natural and spontaneous gesture. Nothing compared to supporting legislation that will ultimately effect that young boy and presently effecting his granny with his anti-Bermuda policies. Hope it wasnt one of the grannies that got pepper sprayed. Wow! Some people dislike this.? Here is a man doing a good deed for a young boy. It’s a shame we have so many haters out there. How wonderful for baron…such professionalism and expertise, especially after the pepper spray issue.